April 12-14 – Arizona Tiki Oasis in Scottsdale. An island lifestyle party in the middle of the desert at the historic Hotel Valley Ho resort. Featuring a marketplace with more than 60 curated artisans, more than 20 educational seminars, mid-century architectural tours, live mermaid performance, art show, luau featuring Polynesian dancers, plus more. Arizona Tiki Oasis artwork by Mookie Sato. After 19 years of organizing the world’s oldest and largest Tiki event (Tiki Oasis in San Diego), the power couple of Baby Doe and Otto von Stroheim decided to expand their horizons in 2019. As a spring sister event to their massive summer bash that draws thousands to Southern California every August, they looked east … but not too far. Arizona Tiki Oasis brings all the hallmarks of the original event to a mid-century desert setting, from a vintage hotel to some of the biggest names in the Tiki revival. The April date makes it one of the first major events of the year, leading into the busy summer season. Scottsdale may not be a Tiki hotbed, but it’s loaded with mid-century architecture and features the perfect vibe for a more sophisticated version of today’s modern Tiki event. Instead of a non-stop party vibe, this more laid-back weekender touts poolside lounging, spa treatments, lounge-style dinners, and late-night dancing. The Hotel Valley Ho, est. 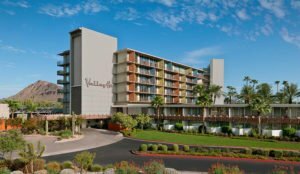 1956 and located in downtown Scottsdale, is the perfect locale. It was recently restored to its former mid-century splendor, blending vintage style with modern amenities. 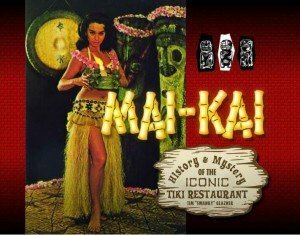 * Pre-party at Hula’s Modern Tiki: The fun starts early with happy hour on Thursday at this Tiki-meets-mid-mod restaurant. Arizona Tiki Oasis fabric by artist Mookie Sato. Pop-up art show: Curated by Baby Doe, this fine art exhibit will feature works by Atomikitty, Big Toe, Candy, Doug Horne, Furious Jim, Harry Decker, The Boozy Doodler, Ken Ruzic, Kymm! Bang, Lisa Penney, Megan Besmirched, Mookie Sato, Odd Rodney, Rarabird, Rob Hawes, Shag, Susana Andrea, Tiki Tony, Tom Cooper, and Willy Tikis. The reception is Thursday and the exhibit will be open Friday thru Sunday. Music and mayhem: Catch live performances by Martini Kings, Moonlight Magic, The Surfside IV, and Marina the Fire Eating Mermaid plus DJs, burlesque and more. Brother Cleve is a longtime musician and musicologist, and also one of the pioneers of the craft cocktail movement. In Search of Tiki in the Sunshine States with Sven Kirsten. Tiki’s Big Bang: Planter’s Punch with Jeff “Beachbum” Berry. 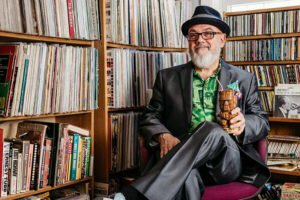 Exotica: The Story of the Sound of Tiki, on a Platter with Brother Cleve. Bosko and the Rebirth of Tiki with Bosko Hrnjak and special guests. Adventureland, Trader Sam, and Two Shots of Rum with Trader Brandon. The Art of Trader Vic’s with Eve Bergeron. Like a Hurricane – Flavor Hacks and Remixes on Iconic Tiki Cocktails with Shannon Mustipher. New Traditionalists with Garret Richard. Create a World of Tiki in Your Home with Pam Kueber. The Tiki-Tiki-Ho-Ho Luau: On Friday night, guests can immerse themselves in a traditional pig roast held poolside with all the trimmings, including Hawaiian-themed desserts and Tiki cocktails. 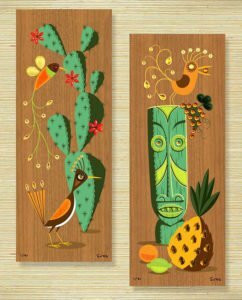 Two new prints on wood, created for Arizona Tiki Oasis by Shag. 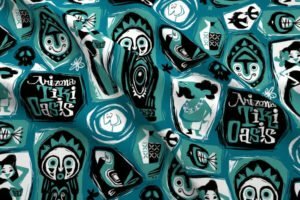 Shag print and shirt release parties: Tiki’s most accomplished artist will release two new, limited-edition items at Arizona Tiki Oasis. Guests will get exclusive access to a new aloha shirt and two different hand-embellished prints on wood, each in editions of only 50. Shop ’til you drop: The Arizona Tiki Oasis Marketplace, open Saturday and Sunday, will feature a dizzying array of vendors, including some of the biggest names in the Tiki art world. Among the many offering their wares, look for Atomikitty, Brian Rechenmacher, Crazy Al Evans, Dionysus Records, Eric October, Mookie Sato, Munktiki, Shag, Tee-Ki Togs, Doug Horne, Tiki Diablo, Bosko, Tiki Tony, Tiki Ray , Trader Brandon, and many more. This entry was posted in Art, Cocktails, Culture, Events, Events, Events, Events calendar, Music, The Tiki Times and tagged Arizona Tiki Oasis, Baby Doe von Stroheim, Brother Cleve, Hotel Valley Ho, Hula's Modern Tiki, Mookie Sato, Otto von Stroheim, Shag, Tiki Oasis. Bookmark the permalink.